The Paralympic Games is a major international multi-sport event, involving athletes with a range of physical disabilities. The social welfare club at KCM organized a similar event with the motive of giving an opportunity and equal treatment to the disabled people. The event was organized in the KCM premises on the 25th June. 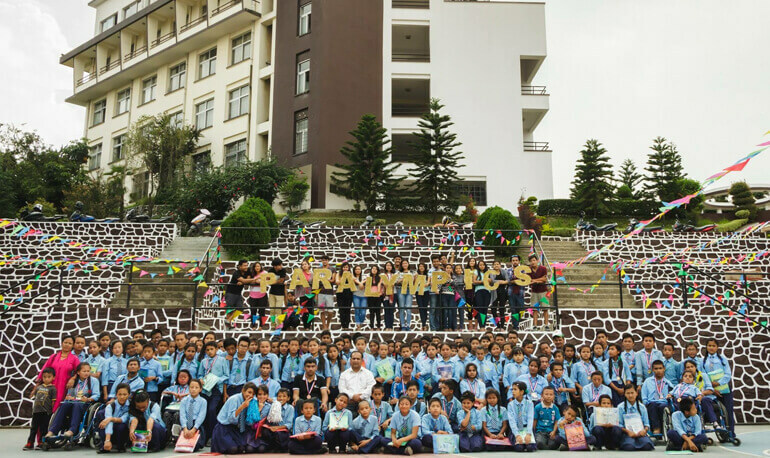 The children arrived at 9:00 A.M. 106 students and two teachers from Khagendra Navajeevan Special Education School were invited for the event. Social service Club provided them breakfast in the canteen and the program started with KCM SWC president Alisha Dwa's speech. The 1st event was the ‘Spoon Race’ competition. It was a race of children holding spoon in their mouth with lemon on it and race towards the finish line. Every games had two rounds i.e. Boys and then Girls. The 2nd was the ‘Wheel Chair Race’ in which the children on their wheel chair raced on their own to the finish line. 3rd competition was ‘Clutch Race’ in which student with clutches raced. 4th was ‘Book-On-Head race’ in which a book was provided to each participants who placed the book on their head walked to the finish line. Towards the end of the event everybody gathered in the canteen for lunch. Club President Alisha Dwa says, "As we had 106 students to look after with only 10-15 volunteers, it was difficult. But the surprising and touching moment was when some children came up to us and asked if they can help with anything." After lunch children were dancing, playing basketball, carrom and chess. At 1:30 P.M., prize distribution ceremony took place where stationery item to every children were distributed as a gift. Then the winners were announced and medals were distributed. To give away the medals we had Mr. Sakar Regmi, Mr. Sameep Babu Malla, Mr. Karan Agrawal, Mr. Sonal Shrestha, Ms. Alisha Dwa and Mr. Rahul Shrestha.